There's this thing called the No True Scotsman fallacy. In its more innocent forms, it manifests as a redefinition of terms if you're challenged, to obviate the possibility of your being called out as wrong. "That's not what I meant, here's what I meant," is the message. A more sinister form occurs when the term you're redefining has to do with ethnic, political, or religious identification. It's this use that gives the fallacy its name; "No true Scotsman would do such a thing!" 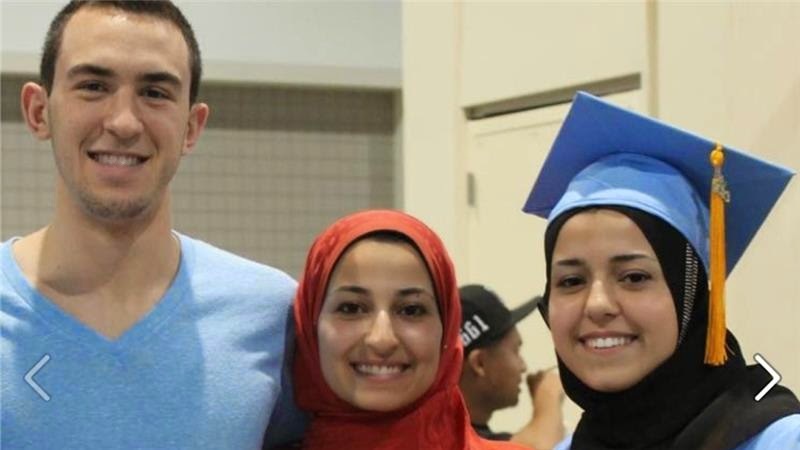 And we're seeing it right now over and over among atheists, who are struggling to understand why One Of Our Own killed three young Muslim students in Chapel Hill, North Carolina. Craig Stephen Hicks, now under arrest for the murders, calls himself an "anti-theist," a term that many atheists relish. They not only disbelieve in god themselves, they are actively against religion, and would prefer it if religious beliefs vanished entirely. Hicks's Facebook posts ask questions such as "why radical Christians and radical Muslims are so opposed to each others’ influence when they agree about so many ideological issues?" He has posted and tweeted texts and pictures mocking religion, and is a fan of The Atheist Experience and Richard Dawkins' The God Delusion. It's easy enough to say that psychopathy does not respect lines of belief, nationality, or ethnicity, and that's true enough. But if that's all we say -- if we call Hicks a psychopath and then turn our attention elsewhere -- we've accepted a facile explanation, and (more importantly) lost an opportunity for self-reflection. Sam Harris: "Islam, more than any other religion human beings have devised, has all the makings of a thoroughgoing cult of death." Richard Dawkins: "[I] often say Islam is the greatest force for evil today." Lawrence Krauss: "Maybe these odious religious thugs [Islamic religious leaders in London] will get their comeuppance?" Christopher Hitchens: "The death toll [in the Middle East] is not nearly high enough... too many [jihadists] have escaped." Now, I've deliberately taken these quotes out of context, but that's to illustrate part of the problem; when we speak or write publicly, that's going to happen. It is absolutely critical for public figures to be as careful as humanly possible, because there are people reading our words, and reading into our words -- and then acting on them. I still admire people like Harris, Dawkins, Krauss, and Hitchens for their unflinching demand that the tenets of religion be questioned and its hegemony no longer accepted as a given. But words have consequences, and when someone like Craig Hicks reads quotes like the above, and decides that the upshot is that Muslims everywhere deserve death, it is incumbent upon us not to shrug it away, but to do some serious self-analysis. People are complex animals, and there are some who use their religious beliefs to perpetrate actions that are truly evil. ("Jihadi John" comes to mind, the British-accented ISIS member who has been filmed beheading innocent captives.) Most of us, though, are not that one-sided. We have our religious beliefs (or lack of them), and they incite us to some good actions, some bad actions, and a lot that are neutral. Most of the time we act how we act for reasons that have nothing to do with our opinion about the existence of a deity. Most importantly, we all come to our understanding of how the universe works in our own way; problems crop up only when people start demanding that everyone take the same path at the same time. And truthfully, even as a diehard atheist myself, I have a hard time convincing myself that the world would be a better place if religion had never existed. Yes, I know about all of the evils perpetrated in its name. But would we really be better off without Bach's Mass in B Minor and Tallis's Spem in Alium? Would the world be as beautiful without Yorkminster, Rouen Cathedral, Chartres Cathedral? Would it have been better if the temples at Angkor Wat and Karnak and Tikal and Xochicalco had never been built? Is the comfort and solace that many derive from their religious beliefs to be dismissed as inconsequential? More to the point, if I object to the religious trying to force their beliefs on me, why should I have the right to eradicate the beliefs of others? These are not easy questions to answer. And whether Hicks was acting out of pure psychopathy, or because he took various anti-theists' words about the eradication of religion as a literal command, or for some other reason entirely, is perhaps impossible to determine. One thing is clear, however; if Hicks's irreligion was the motive for his murder of three innocent young people, that action is just as morally reprehensible as Jihadi John's use of his religion to justify the murders he's committed. What is equally clear, however, is that we atheists have just as much of a responsibility to be careful about how we speak and write as the religious do. And taking the disingenuous route of saying that Craig Stephen Hicks is "No True Atheist" is a complete cop-out. Note: Deah Barakat, one of Hicks' victims, had begun a charity to pay for dental care for Middle Eastern refugees. If you want to donate to his charity as a way of honoring his memory and that of his wife and her sister who were slain with him, here's the link.